Last month the retail restructuring specialist Hilco announced a three-stage restructuring of Habitat worldwide, designed to secure the future of the iconic home furnishings business around the world. On acquisition in 2009 from the Kamprad family, the owners of Ikea, Habitat had posted losses of 100m Euros over three years and this year it was admitted that a return to profitability for the business in the UK appeared unlikely in the near term as many of the stores are expensive and poorly located for a furniture retailer. Habitat has appointed Fraser Gray from Zolfo Cooper as Administrator to the business in the United Kingdom in order to enable a fundamental restructuring of the UK business. As part of the restructuring process, Home Retail Group, the owner of Argos and Homebase, has committed to acquire the rights to the Habitat brand within the United Kingdom, together with three flagship London stores (Tottenham Court Road, King's Road and Finchley Road) and the rights to the e-commerce business set up last year in the UK for a total consideration of £24.5m. The remaining stores which are not being acquired by Home Retail Group will continue to trade as usual while the administrator talks to interested parties. Information correct at time of going to press. We got a little misty eyed despite ourselves at the thought of the disbanding of this iconic brand. There's something terribly comforting about it, after all, many of us grew up, on and older with a Habitat home and walking into a store felt strangely serene. When Terence Conran was at the helm it was indeed an aspirational, inspirational environment of design that was doing something different. The austerity of the post war years was beginning to ease off and people were once again feeling like they didn't have to 'make do and mend' at every opportunity. There was a feeling of bounty and Habitat inhabited that niche. But perhaps Habitat has caused its own demise because, if you're a trend setter you must be prepared for everyone to copy you and if everyone copies you then, before you know it, everyone looks like you and you're not special any more. If left fallow, you'll find yourself in a marketplace saturated with similar, cheaper and maybe even better imitations that come into a right of their own. Habitat did try to stay ahead of the game, going down the route of having celebrity design and endorsement, which has been the marketing standard for getting on for twenty years, since the media explosion. But even that couldn't do the trick. In an attempt to figure out what happened, how the landscape has changed and how we, as furniture makers, might learn from these recent events we went to chew over the fat with two prominent designer/makers of today, Andrew Varrah and Rod Wales. 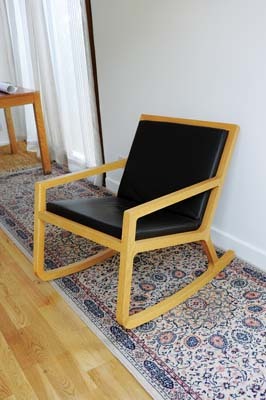 I'm from the mid 60s generation and when I started designing furniture Habitat was a real influence. Never before had the UK seen such a range of new materials, colours and imaginative designs, which suddenly made people think about lifestyle in a different way. Gone was the rather safe, staid and utilitarian styles, which had been retailing for quite a long time in the 50s. As with all innovation there were mistakes with the longevity of some materials, and no doubt some items suffered from more emphasis on form than function. Price was an important factor so it would be unfair to compare a lot of the Habitat furniture with the established furniture retail outlets. The new look and complete change of design approach, made the lack of quality in some pieces worth the â€˜wowâ€™ factor. Perhaps we had inadvertently partly entered the disposable era. When I was teaching design in London I would take my students to the Habitat store in Chelsea, and quite understandably the staff were a bit concerned at the sudden volume of us descending upon them and inspecting the furniture. I was politely asked to reduce the numbers of students, but I did tell them it was their fault as their products were perfect to introduce the next generation to such innovative pieces. Terence Conran was brilliant, innovative, bold and a breath of fresh air. He made us challenge what we had taken for granted before. He was, and still is an inspiration for designers to realise a mould had been broken. He's someone who really deserved his knighthood. I also like the fact he's very much hands on and still shows enormous interest in pursuing his love of new products. I think Habitat seemed to stop at the point when Ikea developed. There was a different attitude between the two. The Ikea emphasis of 'pack it in, pile it high', coupled with exceptionally low prices and an impossible maze to negotiate to find the exit, seemed to contrast with the more civilised Habitat experience of creating an atmosphere conducive to the subtle approach to selling. Unfortunately the price war had begun and we all know who won. 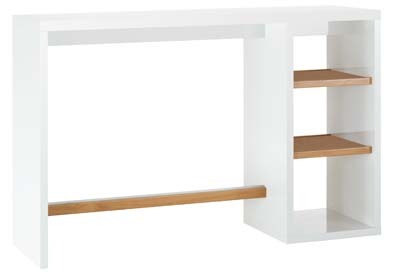 Habitat was caught in a time warp, I sense when Terence Conran moved on to other things, such as Benchmark, he may have left the rudder in the wrong hands. As for what it means for the design market, I doubt it will be a significant factor. Bespoke makers are more likely to attract their clients based on the buyers' perception of wanting individuality and designs specific for a purpose. With that in mind they become (we hope!) seduced into permanently commissioning bespoke furniture. 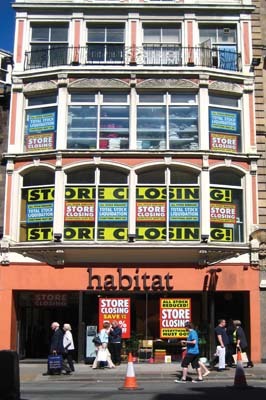 It's sad to see Habitat go, but probably out of nostalgia. I've no doubt that when the furniture retailers of this century are named, Habitat will come high on the list of iconic influences. Perhaps what Habitat did create was a sense of fun and style. I think those who bought from Habitat didn't consciously realise why the products seem to have instant appeal. I suspect, like all of us old enough to have experienced Habitat from day one, there was an enormous sense of liberation in the realisation that our living environment didn't have to be staid, but can be a way of expressing individuality. Suddenly we had a choice, and as we all know, Habitat became an instant success. I wonder what the next innovation will bring. On the continent there's a different, brighter story to be told. Hilco is in advanced talks with a major European listed business for the sale of the profitable European arm of Habitat. Any sale would be subject to clearance from the French Works Council and the competition authorities in France, but the transaction is expected to complete during August. Habitat's international business currently comprises 27 stores in France, six in Spain and five in Germany. Habitat recently opened one of its biggest ever stores in Antibes, France. The group also has franchise arrangements in Belgium and Luxembourg. New store openings will take place in Madrid, Spain and Toulouse, France this summer. So in conclusion it would seem that Habitat has merely lived its life, the landscape's changed and it didn't quite manage to reinvent itself as successfully as Madonna has done over the years. That, coupled with changes in the economy, mood and priorities of the UK and a levelling of middleclass lifestyle expectations have meant that the space it once occupied just doesn't exist any more in the same way. So, sadly and fondly we bid our once natural Habitat adieu and look to the future. 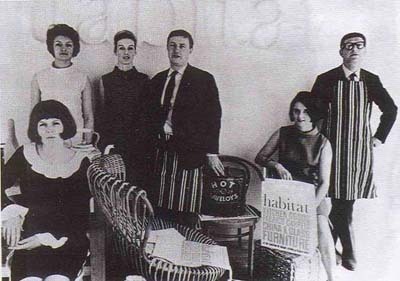 1964: The first Habitat store is opened by Terence Conran, a young furniture designer and restaurateur, on Fulham Road, London. Mid-1960s: Habitat was the first British retailer to introduce the continental duvet to the British public. 1966: Opening of the second Habitat store on Tottenham Court Road, next door to Heals. 1966: The launch of the Habitat catalogue. By the 1970s it had acquired the status of the homemakers bible. 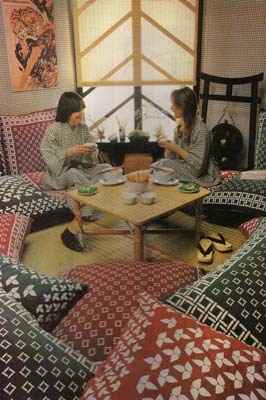 1966: Habitat had a major influence on British cooking habits when it introduced the wok to its stores. 1972: To emphasise the central ethos of the company in art and design, Habitat commissioned a collection of original prints for the Habitat catalogue for the first time. Contributions included those from Peter Blake and David Hockney. 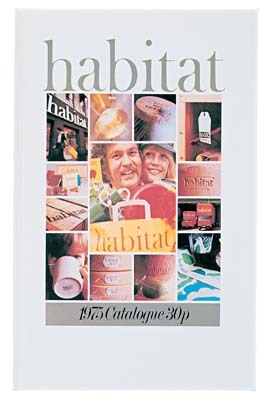 1973: Habitat opens first store in France, in the Montparnasse neighbourhood of Paris. 1981: The company took the bold step of floating its shares on the London Stock Exchange. 1982: Habitat merged with Mothercare Group, which went on to buy Heals and then Richard Shops the following year. 1986: The company merged with British Home Stores to form Storehouse plc. 1990: Sir Terence stepped down as chairman of Storehouse and ceased involvement with Habitat. 1992: Habitat was bought from Storehouse by IKANO, which was owned by the Kamprad family. 1996: To further its ties with the art world and contemporary artists, Habitat set up the Art Club. The following year, it commissioned a set of limited edition prints from artists including Tracy Emin, Gary Hume and Gillian Wearing. 1998: Tom Dixon, the furniture designer, was made the Head of Design and given the task of returning the company to its former glory, with a renewed focus on design and innovation. 2002: The Love Your Home logo was added to signify the basic values of the Habitat brand. 2009: Company was sold to Hilco. 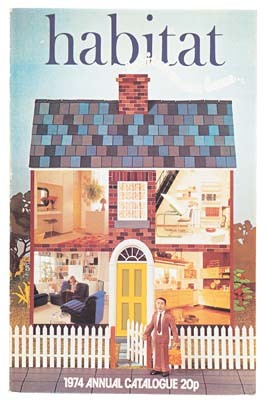 2010: The Habitat catalogue was replaced by the Love Your Home magazine, which was launched in September. The magazine produces three issues a year. 2011: There are 33 leased stores in the UK and 36 stores overseas, comprising 26 in France, five in Spain and five in Germany. There are also e-commerce sites in the UK, France and Germany.